The cards – other than tarot? You are here : Tarot Card Readers » Tarot Card Readings » The cards – other than tarot? Question : The cards – other than tarot? as I looked at her she had tarot cards in her hand but they werent neat, just all messy in her hand, she was head to toe in purple, purple long skirt, top, jacket and a necklace made of purple shiny gems/beads, she had grey/platinum/blonde hair. Years ago I was told by a psychic if you see random playing cards in the street have a look and see what they are and they mean something. Well the morning after that dream, I got on the bus and on my seat was a playing card – 6 of spades!! what does this mean please? Challenges regarding communications, also, possibility of sudden travel under unexpected circumstances. The 6 of Swords shows a change through which we reach new shores. As a card of parting, it falls between the joyful departure of the hero, as shown by the Chariot (VII) and leavetaking with a heavy heart, which is represented by the 8 of Cups. 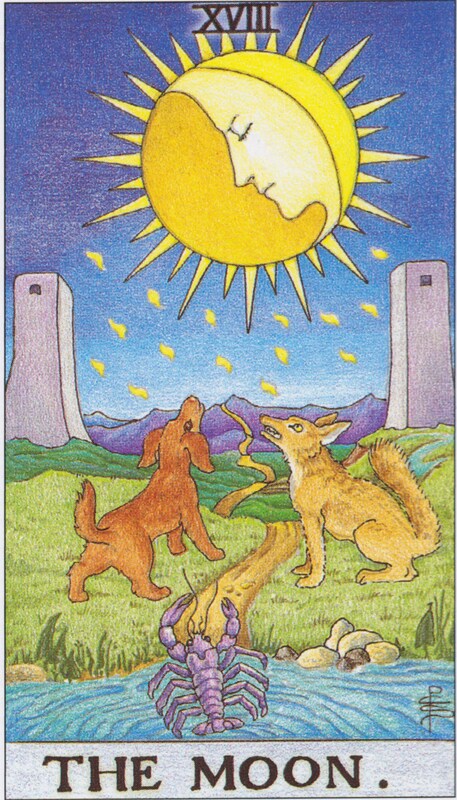 For this present card, it is very much dependent upon us whether the indicated change makes us excited and curious, or whether we experience it fearfully. In any case, it deals with our reaching new shores and having to leave the old ones, without knowing what is really waiting for us on the other side. In this respect, it shows the grief of parting, insecurities, fears, and worries, but also a certain curiosity and tension about what is to come. It is important to see that this new land that we are approaching does not necessarily mean leaving our existing situation. It could just as well indicate an inner step: entering new areas, learning the unknown rules of the game, unfamiliar ways of life, or encountering other cultures and religions. In the I Ching and mythology, crossing water always means the step from plurality to unity. Moving away from turbulence towards calmer times. What a cool dream! I am a professional tarot reader, and in tarot, the 6 of spades is the 6 of swords. When combining the generic message of the card with the uplifting message of your dream, I would say it means that you are headed toward an easier time in your life. Things have been rough in the past, but you’re moving toward experiencing more peace and “good luck”, especially in financial matters (based on a card I just picked out for you and the coins in the dream). If you’ve been concerned about your finances lately, take heart because everything is moving in a positive direction. Question : Can someone help me with the meanings of the Tarot cards mentioned in The Night Circus? I don’t read Tarot, but I did read The Night Circus. I’m writing an essay for school on the symbolism in the Night Circus, and am having a hard time figuring out the meanings of some of the Tarot cards mentioned, but I know they are significant to the story. So I was wondering if any of you either read Tarot cards or the Night Circus and had any ideas on that that could help me out? Specifically, The Tower-I was wondering if that could relate to a cruel “game” the main characters are forced to play or the end of two characters’ romance-and Temperance/The Angel, which is mentioned often in the book, yet I still don’t quite understand its significance. Thanks so much for your time and help! I read tarot, never read The Night Circus. Temperance – The title of this card gives away much of the meaning. What is temperance? Moderation? Balance? The traditional image on this card is that of an angel (usually thought to be the Archangel Michael) performing the ritual of temperance (“tempering” water by pouring hot water into cold and back again until both cups hold luke-warm water.) It signifies a particular kind of balance… taking two opposing extremes and merging them until neither extreme exists any longer to be replaced by something moderate, in-between and, often, easier to deal with. Hope that helps and good luck with your paper! Hello, I am a clairvoyant gifted psychic advisor. I have consulted many through heartache, sadness, divorce, mental & physical abuse, marital problems, and confusion. My spirit guides will help guide you in the right direction, to a path were you can live your best life. With my psychic abilities I will assist you to understand your choices in life and will give insight into your situation. My readings are in-depth, providing time lines and initials; I get straight to the point. I will help you restore love and passion in your life. For instance, are you feeling uncertain about someone or something? With many years of experience as a psychic advisor I will give you accurate answers details and solutions. I specialize in matters of love and the heart and everyday problems that we face in life. Are you feeling lost or confused? Do you want to know what your partner is thinking or feeling about the relationship? Do you want to know if he or she will call and if you have a second chance? Do you want to know if he or she will commit? Do you want to know if you are wasting your time with this person or if there is hope? Find out who your soul mate is. If you are curious or just need confirmation, I am here for you contact me in private chat. Please keep an open mind and be advised I am honest with all my callers. I will tell you what ever I see, good or bad. So let’s discover what’s in store for you. « Tell me everything you know about the paranormal and tarot cards and stuff like that!!! ?